Blackish star Jenifer Lewis made a statement on the 2018 Emmys red carpet with a show of support for Colin Kaepernick. 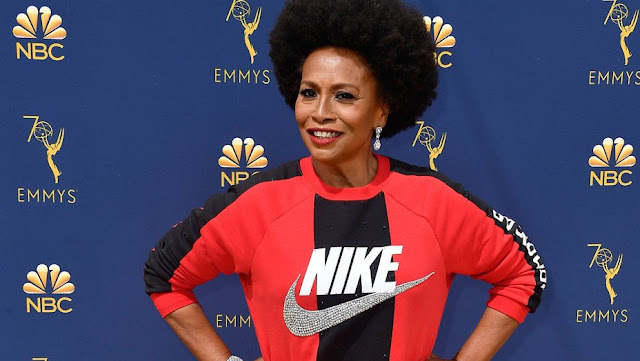 Wearing a Nike sweatshirt with a bedazzled swoosh across the chest, black leggings and black and white shoes, the Black-ish star sported the athletic look ahead of the 70th primetime Emmy awards to stand in solidarity with Kaepernick. The former San Francisco 49ers quarterback, whose kneeling protests against racial injustice during the national anthem before football games sparked a social movement last year, became the face of Nike’s new “Just Do It” campaign in September.